In this bare-knuckled, frankly autobiographical collection, D.R. Haney shares a series of personal essays on his life, struggles, and artistic evolution; from punk rock malcontent in 1980s New York, to B-movie actor in the films of Roger Corman; to screenwriter on Friday the 13th: Part VII; to expatriated American writer in Serbia; to author of the celebrated underground novel Banned for Life. 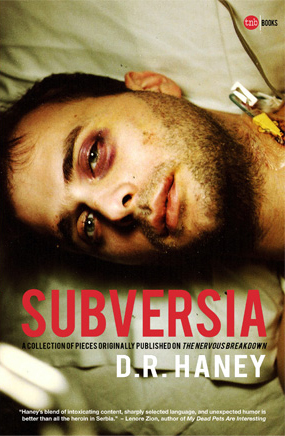 Consisting of material originally published by the popular online literary magazine The Nervous Breakdown, Subversia is written with the bracing candor and lyrical beauty that have earned Haney a well-deserved cult following worldwide.